As you can see in this diagram, two WSO2 ESB’s reside on two sides of the network. The ESB in the unsecure network is connected to different applications in the unsecured network. It also connects to the ESB in the secure network and the communication is encrypted (if needed integrity and non-repudiation can also be ensured) using WS-Security. The ESB in the secure network has all its outbound transports (except JMS transport) removed, hence the ESB can only receive messages from the unsecured network whilst it can only send out messages to a pre-designated message queue. Consumers of this data can listen to the queue and pull messages from the queue once they are queued. Remove/Disable all out-going transports except the JMS and local transport. This can be done by disabling/removing all transportSenders from the following configuration file. The transportSender section of the configuration file should only have the two transports below. Create a Proxy service as given below. Finally Secure the proxy service, you can follow the instructions below to secure a proxy service using the WSO2 ESB. You can now try to invoke the DiodeProxy from the unsecure network, you will notice that no response would be received back from this proxy. Even if a new proxy service is created in the secured ESB, the communication would still be blocked by the ESB as all but the JMS is blocked in the secured ESB. A typical guaranteed delivery scenario covered as an Enterprise Integration ensures the delivery of a message to a given backend endpoint. As per this pattern the ESB would attempt to delivers the message to the backend endpoint and if it fails, the message would be stored and delivered once the backend endpoint becomes available. If the above guaranteed delivery mechanism is implemented to a message flow that is synchronous the client would be waiting for a response from the ESB until the message times out. To accommodate synchronous clients in a guaranteed delivery scenario, it is possible for the ESB to respond to the client with a fault message in case the message is not delivered and stored for later delivery. 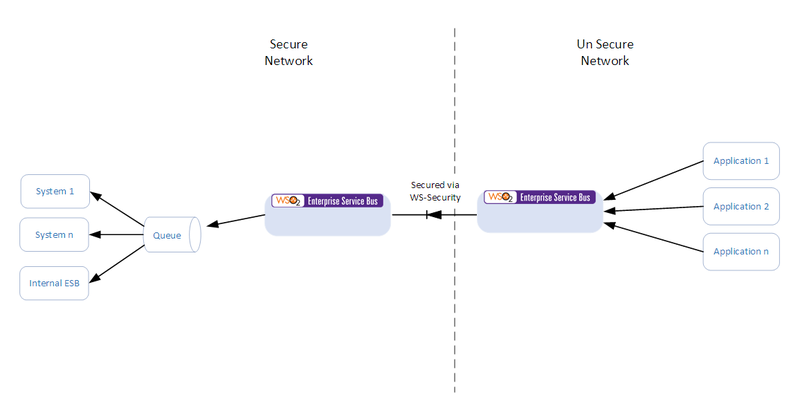 The following diagram depicts the message flow of the guaranteed delivery scenario with client acknowledgement using the WSO2 ESB. Client sends the message to the ESB. ESB picks the message from the queue and try to deliver the message to the backend system; ESB retry can be customized to retry a given number of attempts. Given below is a sample synapse configuration for the scenario. In the example below HTTP POST with a payload “Text send by Nadeesha” is sent to the ESB, which would be replaced as “Text from Nadeesha” and sent to the backend service. The same functionality can also be done using a class mediator where by a Java class can be written to perform the same task. Secure, Expose and Manage a SOAP Service using WSO2 API Manager and WSO2 ESB. WSO2 API Manager provides support for both REST and SOAP based web services. However the API Manager doesn’t support WS Standards. The API Manager and the WSO2 ESB can be used in conjunction to support WS Standards to API’s exposed via the API Manager. In this blog we look at how WSO2 API Manager can be used with the WSO2 ESB to secure and expose a SOAP based API. Given below is a diagram depicting the message flow on how WS-Security is implemented using WSO2 API manager and WSO2 ESB. The message from the client would be encrypted using the public key of the ESB. The encrypted message would be sent along with the acquired OAuth token to the API Manager. The API Manager would validate the OAuth token and enforce throttling on the message. The API Manager would send the encrypted message to the ESB. The ESB would decrypt the content of the message using its own private key and send the request to the backend service. Once the response is received from the backend service, the ESB would encrypt the message using client’s public key and send it to the API Manager. The API Manager would pass-through the message back to the client. The client would decrypt the message using its own private key. 1.WS-Security needs to be enforced but cannot be enforced directly at the backend service (hence needs be enforced in an intermediary stage in the message flow). Client should be provided with a portal to explore and subscribe to API’s. API Publisher wants to manage life-cycle and manage API versioning of the exposed API’s. Throttling and other security mechanisms has to be enforced on-top of WS-Security. Statistics on API invocations needs to be gathered.